The Hague, February 4, 2019 – “Access to justice will remain elusive for many people unless there is meaningful engagement with customary and informal justice systems,” remarked Dr. Ilaria Bottigliero, IDLO’s Director for Policy, Research and Learning as she launched the first of a series of Consultations on the subject with practitioners and policy thinkers. Recurring estimates show that globally, significant proportions of legal disputes are resolved outside of the formal courts through customary and informal systems. The vast majority of these justice seekers are women, poor people, minority groups and marginalized communities. 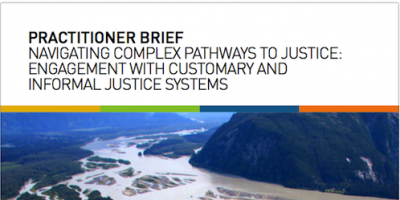 “Customary and informal justice systems are critical pathways in the complex journey to justice for many people around the globe, but they still do not get sufficient attention from policy makers, practitioners and the international community,” added Dr. Bottigliero. 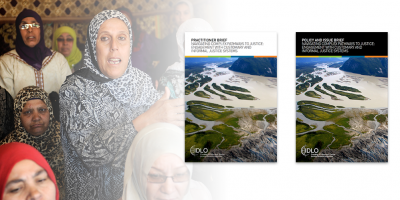 The IDLO Consultations - to be convened in various venues around the world during 2019 - are backed by a series of IDLO publications, Navigating Complex Pathways to Justice, that draw heavily on IDLO’s research and field experience and those of its partners. The first two publications - a Policy and Issue Brief and a Practitioner Brief - underline the advantages of customary and informal justice, including accessibility, affordability, flexibility, speed, cultural relevancy, which have led to a high level of use and trust within communities. They also point out the disadvantages, many of which are rooted in traditional, community or religious values that are at odds with international human rights standards and the rule of law. 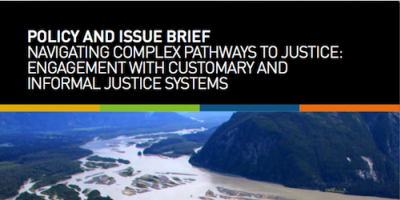 The two Briefs highlight the importance of understanding the context in which such systems operate and recommend a range of practical entry points and solutions for engagement, with the aim to improve justice outcomes and delivery for the end users. “Our Consultations aim to bring together all perspectives in a global conversation about customary and informal justice, so that we can learn from each other how to make the justice experience more inclusive, effective and responsive to ground realities and the needs of justice seekers,” remarked Dr. Bottigliero. The launch of IDLO’s Consultation coincides with the meeting of the Justice Partner Forum in The Hague, convened by the Task Force on Justice, to discuss ways to improve and accelerate access to justice as the international community and governments gear up to assess progress of Sustainable Development Goal (SDG) 16 on peaceful, inclusive societies, access to justice and effective institutions. “We are very pleased that the Task Force is recommending stronger engagement with customary and informal systems as a critical pathway to justice for many poor and marginalized people, and we see our Consultations as a modest contribution to its efforts and the achievement of SDG 16,” said Dr. Bottigliero. Following this first meeting in The Hague, during 2019 IDLO will convene several multi-stakeholder consultations on customary and informal justice, including on the sidelines of the United Nations Commission on the Status of Women, the United Nations Human Rights Council and other venues at the international, regional and national levels in different parts of the world. The dialogue will focus on the relationship between formal and informal justice systems as well as policy and practical challenges that customary and informal justice pose in relation to gender equality, international human rights and other issues. Additional reports will be published during the year to support the Consultations.